The US is the leading Amazon marketplace, with national sales reaching over $160 billion in 2018. The closest single international marketplace to reach those numbers is Germany, and those sales fall just short of $20 billion. However, many businesses are finding success in expanding their reach outside of the US alone. The benefits of the omnichannel approach to eCommerce that we addressed in one of our past blogs is especially relevant when it comes to international selling. US-centric businesses may be surprised if they search their product on an international marketplace, like Amazon.ca. Too often they find their products listed by third party sellers, usually for a much larger selling price than their own! While no one likes to see an unauthorized reseller picking up their stock and upselling it internationally, these listings are usually a sign that there is demand for your product in that country. Where there is demand, there is an opportunity to expand. For sellers looking for ways to expand their availability, increase brand recognition, or explore potential niches for their products, going global can be a great option. So, how does one get started when wanting to expand into other marketplaces? Before you create a shipment and apply to sell on one of Amazon’s other marketplaces, you need to do some research first. While your products may be faring well on Amazon US, selling in another location may not prove to be as fruitful. International customers have different sets of wants and needs compared to customers living in the US. For example, take a look at the best-selling items on Amazon right now. Then, compare it to the best-selling items in Amazon.de, or Amazon Germany. The top-rated categories are entirely different! 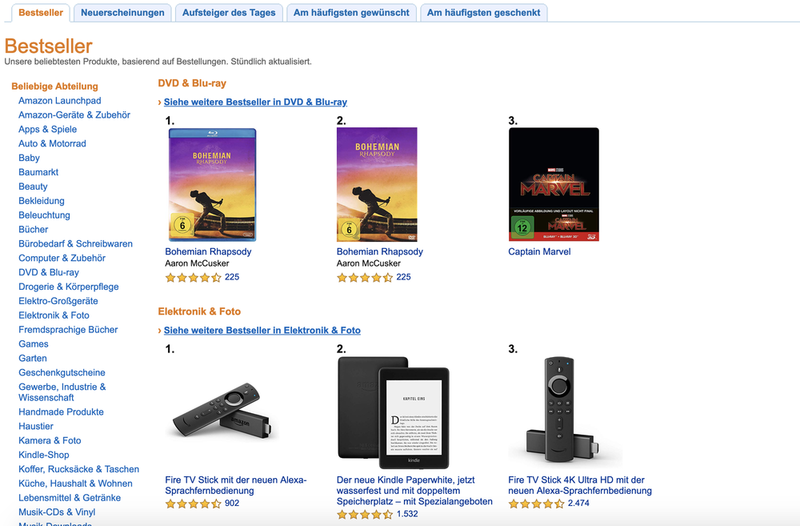 Toys and Games does very well on Amazon US as a category, but Amazon Germany sees the highest sales from DVD and Bluray. Even comparing similar categories we see vast differences in what consumers are interested in. Consider the Best Sellers in the Toys and Games category for Amazon Germany, seen here. Clearly, there is no overlap in this category’s popular products. Part of this rift between marketplaces is due to cultural differences, but businesses also must consider how the size of the audience also determines the success of a product. The population difference between the US and Canada is staggering - over 300 million people live in the US, while under 40 million people live in Canada. It’s no wonder the online sales between the two countries are not at all similar, and why Canada’s total eCommerce revenue skated just under $40 billion last year. This makes it harder for businesses to gauge the profitability of their products, and why they must be careful when assessing how well they expect their product to perform. A product with low demand in the US still has a chance to perform decently - it won’t excel, but you may at least see a small passive profit. However, the same level of demand in an international market, depending on the size of their customer base, can result in a square loss after shipping and storage costs by the sheer absence of sales. While this product does not rank very high in the overall Beauty & Personal Care category, it is within the top 1000 products for its specific niche. Knowing the popularity of your niches, and an estimate of your item’s rank, is important when selling internationally. This is because of the assorted risks and expenses involved in international selling, which can take a huge chunk out of your profit margin if you are not being cautious. Once you’ve gathered some reliable data for what works in each market and where your product is likely to do well, there are still a few things you need to consider before selling. As with selling domestically, your business will need to factor in listing and shipping costs to meet your expected profit margins. This can be a drastically different process when selling internationally due to several reasons. Before your product can even be sold, it must meet individual regulations in the country it is being sent to. This is to determine whether you need to meet certain packaging or shipping requirements and, in some cases, to determine whether your item can be legally sold at all. Next, it is important to assess your shipment duties before exporting. If you have ever imported materials or products from overseas, you may be familiar with at least half of this process. However, no country is the same when it comes to determining duties, and this can heavily affect your bottom line to the point where your product will no longer be profitable at your anticipated selling price. Once your product has made it to its final destination, whether that is a warehouse or directly to the customer, you may run into more expenses related to taxation. We can’t state any cumulative rules to follow, as all countries are different, but we do have some general tips to gain a better understanding of the process. There are a few choices for shipping your product internationally, but the most popular options are choosing a standard carrier or a freight forwarder. For some types of shipments, like ones that must go overseas, your travel is not just restricted to land and you are presented with a few options for water travel. However, for the most part, your shipments will be handled by a forwarder or single carrier. Some standard carriers do not handle international shipments, but the ones that do need declaration forms and invoices created ahead of time. There are some carriers, like Fedex, that offer internal brokerage and aid in the completion of these documents, but otherwise these must be handled by your own broker. A freight forwarder operates in a slightly different fashion, in that they do not utilize a single carrier for shipments. The act of forwarding freight is finding the best deal for each leg of the shipment, and can result in your items using two different shipping methods. For example, a freight forwarder may move your shipment between two different trucks if one truck is expected to arrive sooner at your given destination. This can be a good option for smaller shipments, but sometimes results in being more expensive than using a singular carrier service. Freight forwarders typically do not handle brokerage, and between paying for shipping and a broker you may wind up breaking even compared to not using the service. Once your shipment reaches the border, it must be processed for customs. Ideally, having an idea of the fees associated with customs before you ship is the way to go. Depending on the country you are shipping from, the country of origin for your products, and the country you are shipping to, you acquire a specific duty rate. This information can usually be found on the government website for trade and commerce for the nation you are exporting to, as well as the United States International Trade Commission website. There are typically two expenses related to shipments beyond just transportation fees, and three if you are enlisting a paid broker. The first expense is the tariff on your product. In general, tariffs are paid on the specific item and taxes are paid on the value of the shipment. Tariffs are assessed on every individual item depending on the HS, or Harmonized System, code of your products. This is an international system used for classifying goods into different classes and sub-classes, based on factors like material and utility. For example, a toy car with batteries has a different code than a toy car that is simply made of plastic. Each HS code has its own associated set of tariff rates, which are taken as a percentage cost against the value of your shipment. These rates vary between different nations and are affected by changing trade agreements, so it is important to keep a close watch on developing news surrounding international trade. Typically, businesses opt for a broker to facilitate the shipment of their goods in order to determine the correct HS codes and assess these tariffs. This takes care of the possibility that items are classified incorrectly, potentially resulting in heavy unexpected duties. Once duties are assessed, you must also pay tax on your shipment. Every country has a different way of handling taxes. For example, exporting goods to Canada as a non-resident importer means paying a 5% sales tax on the value of your goods. This is paid in addition to duties, and applies to all importers regardless of their country of origin or the class of goods being shipped. However, things can get complicated if surtaxes are placed on goods. A surtax is an additional fee applied to certain classifications of products, and are often instated as temporary or responsive solutions to trade inequality. What this means is that beyond just monitoring your normal tariff and tax rates, you must be vigilant for any kind of economic or legislative development between the US and the country you wish to supply. ECommerce has been the focus of many recent discussions regarding economic policy worldwide. Unsurprisingly, the steadily growing traction in online shopping has called into question whether online businesses are paying their fair share of taxes in comparison to brick and mortar stores. A recent example has been the Wayfair ruling, which just occurred this past June. In that case, the US Supreme Court ruled that South Dakota can apply the collection of sales tax to internet retailers who sell in the state, even if they don’t have a physical presence there. Many states already have sales tax laws that apply specifically to online sellers, but the determination that taxes can be collected regardless of any physical presence whatsoever - typically, warehouse presence is used as an indicator - sets the stage for new rulings to occur in the near future. The official term for that presence, physical or not, is called “nexus.” If a business has nexus in a state, it means they are obligated to pay sales tax for business carried out within that state. However, the rules for sales tax nexus vary drastically between certain states. Some states require remote sellers to meet a minimum sales threshold, some states require common ownership with an in-state retailer, and some states rule that only the marketplace operator itself must collect sales tax instead of individual sellers. This concept extends internationally, and has just as many variables as the US determination of nexus - with the added addition of out-of-country clauses. Some international leaders have expressed distaste in the way taxation is handled for offshore, online businesses. France’s economy minister, Bruno Le Maire, recently introduced the GAFA Digital Tax - named after the four digital giants it plans to target: Google, Alphabet, Facebook, and Amazon. This digital tax plans to pursue companies that deal in digital wares, such as advertising and streaming services. With these businesses not only avoiding the taxes applied to brick and mortar service centers, which can be upwards of 23%, but having the freedom to report their revenue to any country within the EU, it is no wonder this legislation is being established. Businesses like Google, for example, report their revenue to Ireland despite offering services to all of EU because of the favorable rates, and chose to place their physical headquarters there for the same reason. Additionally, a recent report from the UK’s Housing, Communities and Local Government Committee instigated calls for higher taxation on internet retailers. This move would directly affect businesses like Amazon and Asos, which will in turn likely fall back on marketplace sellers - increasing tax burdens on their sales to make up for the cost. Amazon only pays around 0.7 percent of its revenue in UK taxes, for perspective. Determining nexus and tax obligations internationally is not going to be an issue that gets resolved quickly and solidly. As a business entering the international market, it is important to keep your wits about you and to start small. Issues concerning eCommerce regulations have been cropping up quickly, and maintaining a profitable presence in other countries means staying ahead of risks. For this reason, we suggest first channeling your products through experienced sellers in dedicated marketplace spaces, rather than selling independently through your business website. As a standalone business, you are more likely to be forced to absorb additional taxes levied against eCommerce retailers than you are operating through a marketplace where, typically, the marketplace itself is likely to absorb expense. Having access to networked warehouses overseas, as well, limits your tax burden, and is usually only available to marketplace sellers. It can be difficult for online businesses to step outside of their comfort zone. With things like language barriers, policy shifts, and customer bases that can be hard to identify, staying within the US sounds like a safer bet - and for some businesses, it is. Just because a product does well in the US, does not mean it will do well internationally. For some products, this makes immediate sense - a witty coffee mug with an English saying written on it likely won’t perform well in a market where English is not the primary language. However, there are other nuances to international culture that a US business might not be immediately aware of, like packaging preferences or color associations. That is only the first step. Assessing your profit after duties, shipment, and storage can make what is otherwise an easy sell domestically into something not even worth shipping out internationally. Every expense needs to be considered before expansion, and keeping an eye ahead at future developments with eCommerce policies worldwide only suggest things will get more difficult to navigate. However, being an internationally-known business is a chance at success that, if pursued correctly, carries a great pay-off.